The ESIP data set contains polygons representing the shoreline and coastal habitats of the Upper Coast of Texas, classified according to the Environmental Sensitivity Index (ESI) classification system. This data set comprises a portion of the ESI data for the Upper Coast of Texas. ESI data characterize the marine and coastal environments and wildlife by their sensitivity to spilled oil. The ESI data include information for three main components: shoreline habitats, sensitive biological resources, and human-use resources. See also the ESIL (ESI shoreline lines) and HYDRO (Hydrography lines and polygons) data layers, part of the larger Upper Coast of Texas ESI database, for additional shoreline information. Access Constraints: None | Use Constraints: DO NOT USE MAPS FOR NAVIGATIONAL PURPOSES. Besides the above warning, there are no use constraints on these data. Note that the ESI database should not be used to the exclusion of other pertinent data or information held by state or federal agencies or other organizations. Likewise, information contained in the database cannot be used in place of consultations with environmental, natural resource, and cultural resource agencies, or in place of field surveys. Recognize that the information contained in the ESI database represents known concentration areas or occurrences of natural, cultural, and human-use resources, but does not necessarily represent the full distribution or range of each species or resource. This is particularly important to recognize when considering potential impacts to protected resources, such as endangered species, wetlands, etc. Acknowledgment of the originators, publishers, contributors, and sources listed would be appreciated in products derived from these data. | Distribution Liability: Although these data have been processed successfully on a computer system at the National Oceanic and Atmospheric Administration (NOAA), no warranty, expressed or implied, is made by NOAA regarding the utility of the data on any other system, nor shall the act of distribution constitute any such warranty. NOAA warrants the delivery of this product in computer-readable format. If problems are encountered in downloading the ESI data or with file corruption, contact NOAA (see Distributor). These data represent a snapshot in time and temporal changes may have occurred. The data are not intended to include all biological or human-use resources present in an area; they focus on species and resources particularly sensitive to oiling. In the event of a spill, they should be used for a first assessment only. The data providers are the experts with regard to individual resources. They should be contacted to confirm if more current data exist or if in-depth information is needed about a particular resource. 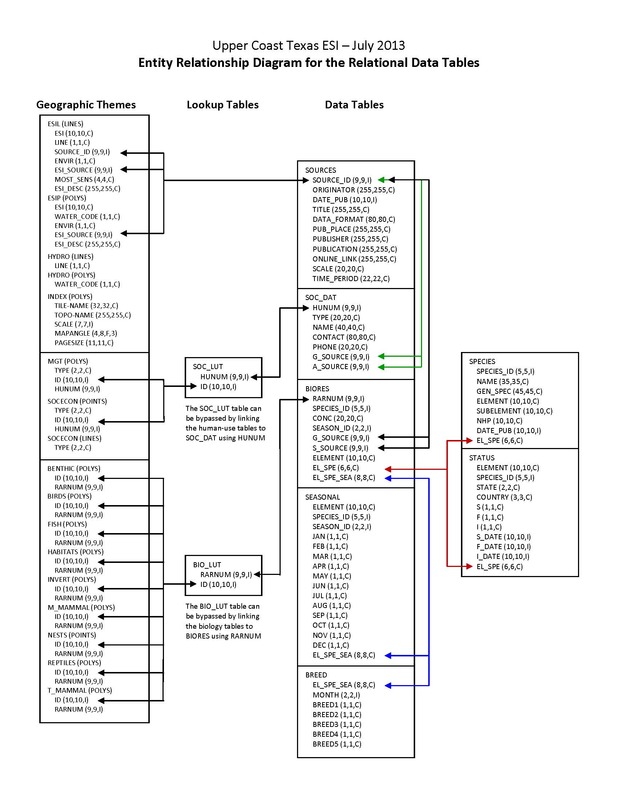 Depicts the relationships between spatial data layers and attribute data tables for the Upper Coast of Texas ESI data.